These Long Lasting Sign Supplies With LEDs Highlight Your Duratrans Posters And Really Get Attention! Don't Let This Sign Supply For Sale Pass You By! Purchase Online Today! 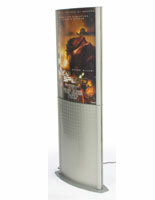 Illuminated presentation is also energy-efficient, using LED technology. Snap-open frame makes adding posters quick and easy. Black, steel design is durable yet lightweight. Lightbox displays employ LED technology to highlight your images evenly and without hot or cold spots. . These LED frame fixtures have a slender profile, taking up little area and eventually saving on energy prices. The edge-illuminated sign supply for translucent images is also so capable, you will be able to employ it consistently for over eleven (11) years! These LED poster lightboxes, like free-standing showcases and well lit directories, produce outstanding displays that onlookers won't be able to ignore! 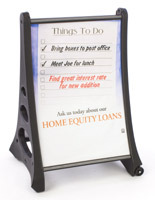 These displays make excellent publicizing or informative aids to be utilized inside of any eatery, commercial shop, or trade show booth. The free-standing fixtures, sign supplies provide a user more options in positioning an LED frame in numerous venues, like in a front entryway, and not just only on a wall. The sign supplies are designed to accommodate horizontal, 36"w x 24"h images printed on translucent panels, like Duratrans. By utilizing these translucent goods, you will produce vibrant, appealing displays. 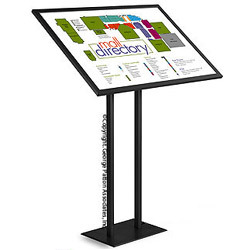 These retail sign supplies for interior use, also recognized as poster lightboxes, even incorporate an acrylic compartment and tubular design that conceals and organizes a power cord. 37.8" x 53.0" x 11.5"